Not many people lead a life in which every hobby and passion aligns with one mission, but MKA science teacher and Montclair resident Mr. Ben Rich comes quite close. 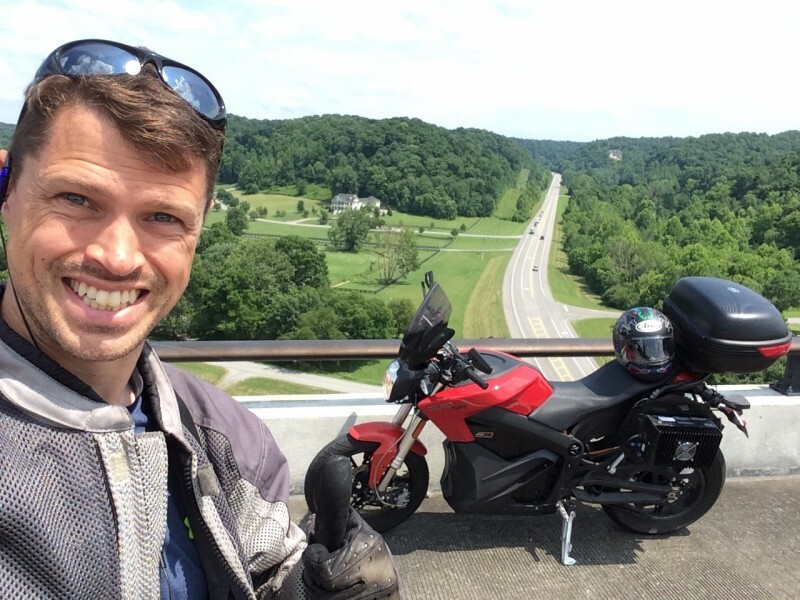 His world seems to revolve around the statement: “save and love the earth.” Whether via teaching environmental science, riding around the country on his electric motorcycle, or swing dancing, he lives by that truth every single day. Example: when he groggily answered the phone for this interview, he apologized for sounding tired, saying he had just returned from a long weekend of hiking up in the Hudson Valley. Enough said. A Wolfeboro, NH native and Colgate University alum, Ben Rich has been teaching at MKA for the past six years. Prior to that, he taught at St. Andrews Episcopal School near Washington, D.C., as well as Convent of the Sacred Heart in CT. He was a Coordinator for the Learning and the Brain Conference in 2009, a “Schools Attuned Certified Teacher” in that same year, and a NSTA National Conference Participant in 2006. He is a tutor for Embrace Tutoring & Educational Services, based in Chatham, NJ, where he teaches Physics, Geometry, Algebra, Environmental Science, SAT Math, and ACT Math & Science. Embrace has recently featured Mr. Rich as a premier tutor, thanks to his success with and popularity among the students. Each summer, Mr. Rich goes on a cross-country road trip; however, not in your average vehicle. What does one do when he has a passion for traveling but doesn’t want to pump chemicals into the environment, you ask? One buys an electric motorcycle, of course. When electric cars gained popularity several years ago, Mr. Rich decided they were too expensive but that he would purchase the next best thing: an electric motorcycle. And so, each summer, he rides across the country using nothing but electricity. A teaching career seems a perfect fit for him, since he is able to fulfill his love of travel during his summers off. In 2013, he traveled from Charleston, SC to the Google headquarters in Mountain View, CA, and this past year he traveled all the way from his home base in New Jersey to Florida, to Mexico, and then to Canada. When asked if he’s ever had a bad accident, he admitted there have been a few. But he ultimately said it’s like everything else in life: “I’ve fallen, but I get back up.” Again, a great example of the kind of wisdom Mr. Rich inevitably instills in his students through practicing what he preaches. An active member of the New Jersey Electric Auto Association, Mr. Rich can often be found at various car shows and motorcycle events around the country, promoting the electric “movement.” In addition to attending these events, he writes for the online publication GreenCarReports.com, and annually provides them with a well-researched “Electric Motorcycle Buyer’s Guide!” Mr. Rich enjoys the solace he is able to find on his motorcycle trips, but he mentioned that his travel is also a great opportunity to see all of the friends he’s made through his swing-dancing hobby! But it’s not just a hobby: Mr. Rich is an award-winning dancer! This past year his team– dubbed “Yeah Man!”– won the team division award at the International Lindy Hop Championship in Washington, D.C. This winter, American Motorcyclist Association Magazine will publish a feature on Mr. Rich– he expects it will be released in either December or January. He also mentioned that one can go to YouTube and look up “2015 El Moto Road Trip” to find videos of his trips across the U.S. The world needs more teachers like Mr. Rich: passionate individuals who are able to inspire their students by doing. Congratulations, Mr. Rich, on your well-deserved recognition as a premier tutor with Embrace Tutoring & Educational Services.